Cellulose insulation has been used to insulate homes for many years. Cellulose is manufactured from recycled newsprint and other recycled paper. Before manufacturing is completed, it is treated with non-toxic fire retardants. 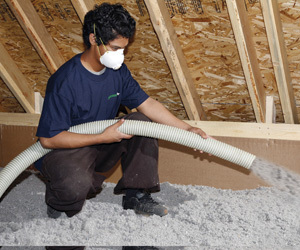 Cellulose insulation is a durable, safe, cost-effective solution to home insulation needs. Cellulose insulation is used in ways similar to how blown-in fiberglass insulation would be used. It can be blown in to attics in both new and existing homes, and it can be dense-packed into closed cavities such as existing walls. We install cellulose insulation from Cell-Pak. Click here to learn more about their products. Wondering if cellulose insulation is right for your project? Contact our office and we are happy to answer your questions.